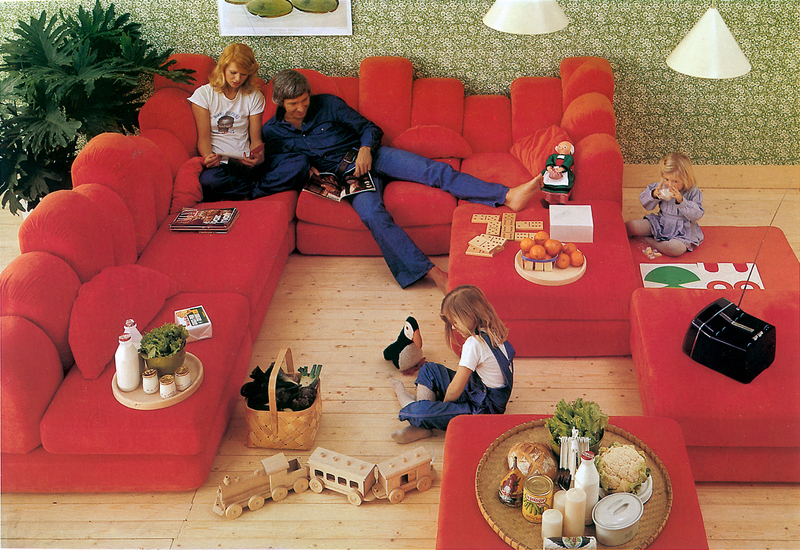 A retro advertisement for the Dromedary Sofa, designed by Hans Hopfer in 1974. “Bobois” translated to “beautiful wood,” is evident in the precise mortise and tenon joinery of Stephane Lebrun’s Assemblage Table. Pastilli Armchair, Eero Aarnio, 1968. The Plateau Sofa (1971) was part of Roche Bobois’ “New Science of Sitting" campaign, which emphasized customizable and flexible furniture arrangements. Imagine Sofa, Hans Hopfer, 1990. Nuage Armchair, R. Tapinassi and M. Manzoni, 2005. The solid oak Legend Bookcase, created by agronomist-turned-designer Christophe Delcourt in 2006, is an abstraction of a tree, and reminiscent of the Carlton bookcase Ettore Sottsass designed for Memphis in the 1980s. Cute Cut coffee table, Cederic Ragot, 2006. The Flap Bookcase, designed by René Bouchara in 2007, features articulated flaps that can be rotated at will to create filled spaces and voids. Chabada Chairs, Daniel Rode, 2008. Designers El-Oulhani, Garzon, and Sionis were inspired by the architectural work of bees, and translated the structure of a honeycomb in their 2008 Fossile bookcase. Quadrifoglio Floorlamp, Sophie Larger, 2009. Rythme Sofa, fabrics by Missoni Home, 2009. The metal legs of the Axiome Sofa pay subtle homage to Jean Prouvé. Designed by M. Tapinassi and M. Manzoni, 2009. Cancan Floorlamp, Jean-Marc Gady, 2009. Part of Roche Bobois eco-themed design, the Saga Sideboard—designed by Christophe Delcourt in 2009—features a cross section of a tree trunk on the side panels. Mah Jong Couture Sofa, designed by Hans Hopfer and dressed by Jean Paul Gautier, 2010. Mayflower Armchair, Fabrice Berrux, 2010.